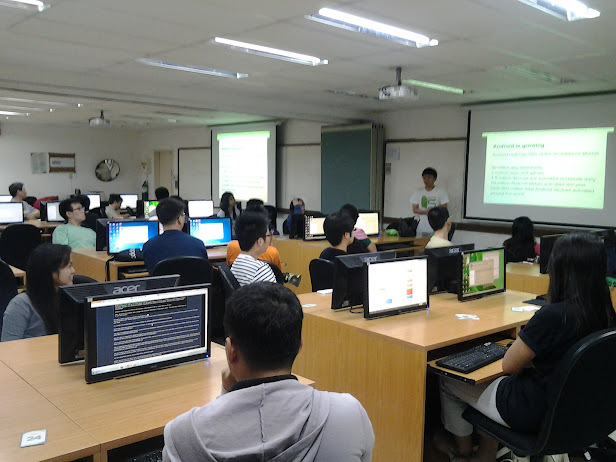 GDG Philippines and the Gooogle Student Ambassadors from DLSU organized a MapUp and an Android Code Lab at De La Salle University last September 28, 2013. After lunch, I had a quick talk about the different kinds of views they can use and how to move from one page to another. We tasked them do to anything that they can finish in less than two hours. I roamed around and helped the participants with their questions. After the coding, they were asked to demonstrate their apps and we gave special swags to the apps who found to be promising. I encouraged them to continue developing their apps and to publish it to Google Play later on.